Oh wait, no I did point out, again, that you approach every argument, ever, with the firm belief that it's impossible for you to ever be wrong, ever. Did I say ever enough? I'm not quite sure. The only misconception would be around any doubt over what the trade tariffs will be on a no deal Brexit. We know what they'll be; the same as the EU, as outlined by our submitted draft WTO schedules. So, yes, in a no deal Brexit situation, it's going to hurt. Especually seeing as our draft schedules are specified using Euros, so devaluing the pound hurts us even more. Oh and while we're at it, that you don't understand the difference between currency devaluation and currency depreciation. You've made repeated comments about me, rather than the arguments I've made. You've made sarcastic remarks that why am I not running the treasury or something. I don't need you to validate my opinions, I had 2 (pro-EU) lecturers who seemed to think I was pretty good at debating this sort of stuff. But by all means, explain why you're more qualified to talk economics than me. We've submitted draft schedules whilst working towards making a deal with the EU. If you've ever seen the list of commodity codes that are used, it's easy to see why they've just copied and pasted the existing schedules as a starting point. However, it would be negligent of the government to not revise our tariffs should we leave without a deal, for the reasons we've discussed at length. But obviously, they're not going to submit schedules based on a no deal situation when they're aiming for a different outcome. I know about speculative trading - what I was querying was why you thought the pound wasn't actually weaker now compared to before the referendum. £1 bought about €1.30 back in 2016, now it's around €1.15. There's been a definite fall in the value of the pound that makes imports from the Eurozone more expensive, exports cheaper. That's the reality of the last couple of years. It's anticipated the pound will fall again when we leave based on the same mechanism that caused it to fall two years ago - the fact the reason for a lack of confidence in the pound is different (voting to leave v actually leaving) doesn't change the end result. If you really wanted to find the flaw in the argument, you should be pointing out that once there's some certainty about how we are leaving, that could instill some confidence in the pound and we won't see a fall. That would change the dynamics of our trade. Although I still don't think it would make a recession likely, it would just require a different response. Currency devaluation/depreciation are interchangeable in every day use and context made it clear what I was talking about as the UK doesn't have a fixed exchange rate, but yes, technically I mean depreciation rather than devaluation. OH MY GOD YOU'VE GOT ME AT LAST, I GOT SOMETHING WRONG!!! OH NO, I'M MELTING!!! Meanwhile, and somewhat unsurprisingly, the EU declines to reopen talks after the UK has shown it's hand last night that we don't want to leave without a deal. What a shock. Who knew our politicians were idiots? And the EU ones too. Neither side has shown a duty of care to their citizens. It could all have worked out a lot easier if both sides had accepted that the UK had democratically decided to leave and they needed to work quickly to establish how we could both work side by side after the event. Instead our MPs have tried their best to find a way to keep us in, whilst the EU want to make it as difficult as possible to dissuade anyone else from quitting their paradise. I think if they were a bit more long-sighted, the EU would realise they need a deal more because they don't have the flexibility to manage their economy as a single nation. You've made repeated comments about me, rather than the arguments I've made. You've made sarcastic remarks that why am I not running the treasury or something. But don't you see you employ the exact same tone? You start off preaching and then get uppity when someone makes a personal jibe in retaliation to one of your own. Grow a thicker skin and be less hypocritical for God's sake. And whoopdidoo, you have a 20 year old economics a level. Good Lord, it's clearly the end of days! But you do also realise there's a difference between depreciation from speculation on the market which is all that happened after the Brexitan vote with investors getting scared, and depreciation from an actual economic change such as having a complete new set of trade tariffs to adhere to and having no infrastructure to actually process imports from 27 countries? OH MY GOD YOU'VE GOT ME AT LAST, I GOT SOMETHING WRONG!!! OH NO, I'M MELTING!!! I've only kept half an eye on their situation recently, but wouldn't they have gone into a recession either way? They've been heading towards it for ages. They all need to go and research the Nash equilibrium. So you're saying you were retaliating to a personal jibe from me when you said I was pulling research out my arse and you sarcastically asked why I wasn't working for the treasury? What was it? I only criticised your arguments, not you. You tried discrediting my right to make an argument. I don't actually get why you keep saying I always have to be right, it just comes across as bitterness that I'm making a better point. Perhaps the difference is I pick my battles, check my facts, and recognise when I should give up an argument. There's a difference in reason, not a difference in outcome. If the pound goes down 5 cents, it's down 5 cents, doesn't matter what was the catalyst for that fall. I'm still struggling to see why you think the fall after the referendum isn't real or doesn't affect the economy? They've been in the EU for ages too... The fact they're signed up to the Euro seems to be a big frustration for their government, they have to abide by centralised rules that mean they don't have the freedom to tackle their problems how they want. But then they've built up huge debt that they've not felt the need to address. So who knows how'd they'd be governed otherwise? It shows why having another referendum would create more headaches. 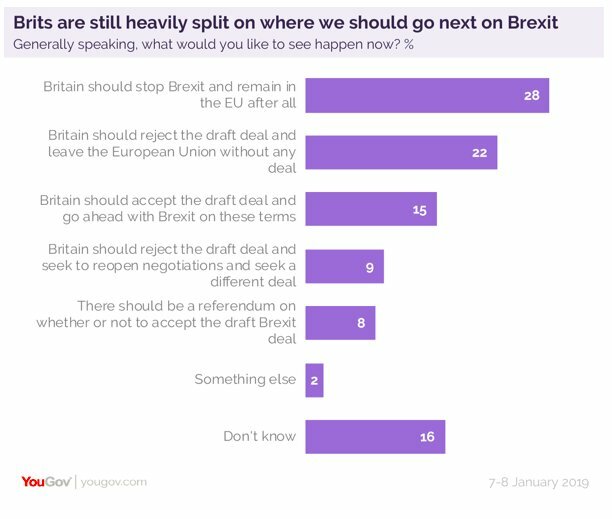 It also shows that at least 46% of those polled still want Brexit in some form. Depressing (to me at least). That's always been the arrogance of the approach by many politicians. They simply don't want to accept that there are a whole lot of people who don't want to be in the EU, for all sorts of reason. That include things such as racism, xenophobia and so on, but also include things such as wanting to trade elsewhere in a manner more advantageous to the UK, wanting to protect local jobs, wanting to get away from the overt bureaucracy of the EU and so on.